In 1970, as a young marine biologist, Clarence Hickey won a position on the staff of the New York State Ocean Sciences Laboratory, Montauk, NY. For the next five years he was involved in landmark studies of Long Island's then-thriving fisheries. He developed deep bonds with the Baymen and ocean fishers who called the East End of Long Island home, and worked closely with them as he and the Ocean Sciences Lab studied the habits and prospects of more than one hundred species of fish and shellfish that call Long Island home — or visit our waters on a regular basis. This is his loving, anguished memoir of those years, replete with vivid portraits of the traditional fishers and scientists he worked with, their habits and discoveries, and their history-suffused community. Like their brethren to the north and south on the East Coast, Long Island's "Bonacker" fishing community represents a long and colorful tradition celebrated most famously in Peter Mattheissen's classic Men's Lives. Hickey's memoir is an elegiac complement to that book. Perhaps more important, Hickey calls for our deep attention to the destruction — in less than a generation — of a crucial natural resource. The contrast between Clarence's years on the East End and today is stark and disturbing. Over the last forty years he has revisited his beloved East End regularly, and watched with alarm as our ecosystem — and it's community — has declined. 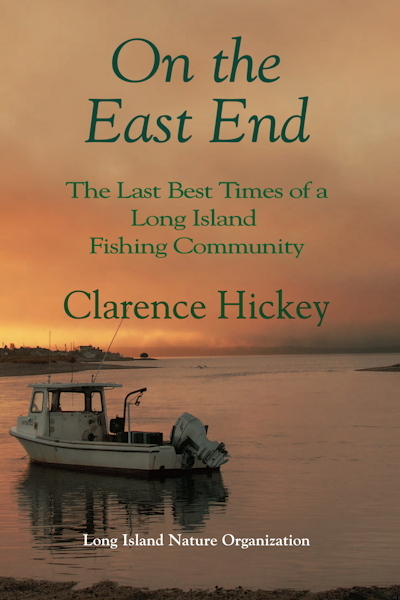 On the East End is Clarence Hickey's clarion call for us to preserve and revive the natural community he fell in love with when he was young. A publicationof the Long Island Nature Organization.